The 12th day of Christmas has officially passed, so those with decorated trees up have run out of palatable excuses and now you just look lazy. Luckily, you still have one more day to take advantage of the City’s ridiculously easy tree recycling program at Zilker Park. Just drive up next to the Zilker Tree between 10am and 4pm and some well-meaning volunteers will gladly relieve you of your tannenbaum and heave it into the evergreen graveyard nearby. If you miss tomorrow’s last chance at Zilker, the City will also collect your tree as part of normal Pay-As-You-Throw curbside collection. But then you’ll possibly have to cut the tree in half and be subjected to the capricious scrutiny of your friendly garbage collector as to whether your tree meets recycling spec. More information, along with amusing anthropomorphic tree graphics, are available on the City’s website [.pdf]. 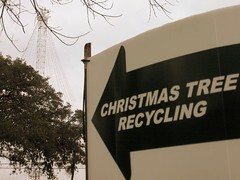 And regardless of whether you recycle your tree or toss it alongside MoPac at 3 in the morning, the fruits of the recycling program will be available later this month when the City makes the mulch available to the public. Just know that your mulch will be tainted with bilious guilt if you don’t actually recycle your own tree. And while you’re at it, please take the Frosty the Snowman out of your pecan tree. It scares the children.